Ryobi Limited (リョービ株式会社, Ryobi Kabushiki-kaisha) is a Japanese manufacturer of components for the automobile, electronics, and telecommunications industries. It also sells printing equipment, power tools, and builders' hardware. Ryobi Power Tools and Ryobi Outdoor Power Equipment are brands of Techtronic Industries, used under license from Ryobi Limited. Techtronics Industries also owns Milwaukee, AEG (AEG Powertools, licensed from Electrolux), Homelite, Hoover US, Dirt Devil, and Vax. Ryobi Seisakusho Co., Ltd. was founded in 1943, with the sale of die cast products commencing a year later. 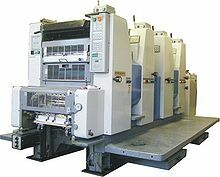 In 1961 the company began manufacturing offset printing presses and was listed on the Tokyo Stock Exchange; production of power tools began in 1968. The company's name changed in 1973 to its current one. Ryobi operates 12 manufacturing facilities across six countries. In 1985, Ryobi launched production in Shelbyville, Indiana, its only manufacturing location in the United States. Ryobi signed an official partnership deal with German football team Hertha Berlin in 2014. The Ryobi Tools brand in North America, Europe, Australia and New Zealand is owned by Techtronic Industries of Hong Kong, an original equipment manufacturer for brands such as Craftsman, Milwaukee, AEG (AEG Powertools, licensed from Electrolux), Ryobi, Homelite, Hoover US, Dirt Devil, and Vax. Around 1988, Ryobi purchased the assets of the former Diehl Motor Company (a one-time division of Singer Corporation), which was the supplier of Sears Craftsman hand-held power tools. After the purchase, Ryobi continued to supply Sears with power tools. These tools typically had a model number beginning with "315" or "973". In the United States and Canada, Ryobi power tools are sold primarily through Home Depot and the Internet. In Australia and New Zealand the line is sold exclusively by Bunnings Warehouse. In the UK the power tools are sold at hardware stores. Ryobi Die Casting (USA) Incorporated, is a Shelbyville, Indiana manufacturer of products for the automobile industry. Ryobi Finance Corporation is a financial operations company of the Ryobi Group located in Chicago, Illinois. ^ "Corporate Information". Ryobi Ltd. Retrieved October 18, 2016. ^ "Ryobi Annual Report ()2016)" (PDF). Ryobi Ltd. Retrieved October 18, 2016. ^ a b "Company Profile". Nikkei Asian Review. Nikkei Inc. Retrieved October 18, 2016. ^ "Corporate Information - History". Ryobi Ltd. Retrieved October 18, 2016. ^ "USA - Ryobi to expand Indiana operation". Foundry-Planet Ltd. July 29, 2016. Retrieved October 18, 2016. ^ Dudley, George (July 6, 2016). "Ryobi extends partnership with Hertha Berlin". SportsPro. Retrieved October 18, 2016. This page was last edited on 7 April 2019, at 15:23 (UTC).